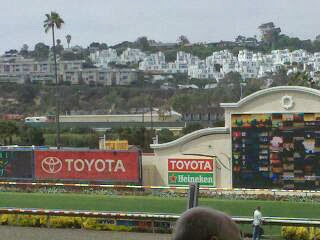 At the Del Mar Race Track, and right next to the scoreboard is an advertisement with Toyota and Heineken together. Not only does toyota have to recall millions of vehicles but now they share an advertisement with Heineken. Leading one to think it's okay to promote drinking and driving. Rarely do I tout products, however if I use something and it's good, then I think everyone should know about it. That's why I also Yelp when I find a good retail place or restaurant and conversely when I find a bad one I like to warn people as well. If you are like every other computer user on earth and you are not backing up your PC you're asking for some serious pain. Don't think it won't happen to you? Well, it will. Not if, but when. Anyway, one of the cheapest, easiest solutions available today is the HP SimpleSave. It really is the easiest, simplest backup device I have ever seen. And, if you get it from Amazon there's no tax and shipping is currently free. It's a no brainier, so save your data and get one below today.